The eighty unit mixed-use Project, along Central and California Avenues, is designed as an Urban Community, with proximity to Glendale's downtown commercial core and the two large shopping malls, Glendale Galleria and Americana, both of which are in easy walking distance. The Project, with its 34 one bedroom, 24 two bedroom and 13 three bedroom amply sized condominiums residences and the perimeter ribbon of 9 Live-Work is designed to create a sense of Community. Legendary Tower Glendale invites living in the traditional urban community style and engendering close ties between the residents and their local neighbors and merchants. The raised podium courtyard design, with its pool and entertainment areas, creates environs for shared experiences and building relationships. The Project also has a fitness center and community room that can serve a multitude of purposes. The Project is a contemporary architectural style using state of the art materials and finishes. The 2-story glass face at street level invites the community into the Project and creates opportunity for the Live-Work residents. The public space at ground level at the corner of Central and California Avenues with the intended adjacent restaurant space will activate the Project and its surrounding areas as a destination. The Project will use its glass face and the glass columns as a canvas for a bold public art presentation. Landscape design both complements the architectural elements and makes its own statement in the courtyard were rows of palms create inviting spaces and a sense of elegant living akin to resort destinations. 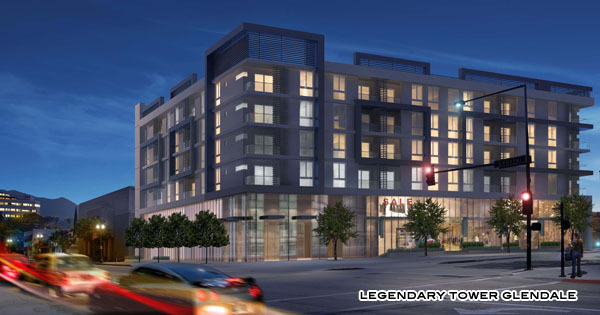 Visit us at : http://www.legendaryglendale.com for more information.